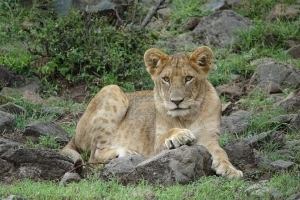 Masai Mara National Reserve Kenya-Masai Mara safari in Kenya tour. 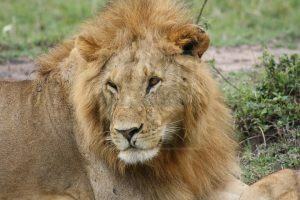 Masai Mara National Reserve is one of Africa’s most popular tourist destinations found in Kenya. Located in the Great Rift Valley the reserve is home for Lions, Elephants, Leopards, Giraffes, Buffalo, Hyena, Zebras, Antelopes etc. Maasai Mara National Reserve Kenya is known to be the largest in Narok County in the destination Kenya adjoining the Tanzania’s Serengeti National Park. The National Park is named after the Maasai people who are the native settlers of the land with their description of it when viewed at a distance (Mara) as Spotted (Maa) explaining its tree circles, Savannah, scrub and shadows of cloud in the area. 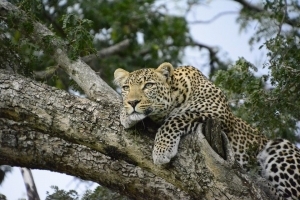 The Maasai Mara is worldly known for its enormous counts of Maasai lion, Tanzanian Cheetahs and African Leopards not forgetting the iconic annual great migration of Thomson’s gazelle, Zebra and the Wildebeest in July to the month of October to and from the Tanzania’s Serengeti. 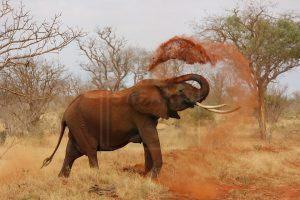 Maasai Mara National Reserve is recorded as a section of the greater Mara Eco system comprising of other group ranches like Lemek, Koiyaki, Ol Chorro Oirowua, Siana, Olkinyei, Maji Moto, Ol Derkesi, Naikara, Kerinkani, Kimintet and Oloirien. Initially established in the year 1961 covering 520km2, Maasai Mara was by then a wildlife Sanctuary which was later extended to cover 1,821km2 to become a game reserve. The Reserve management was at this time taken over by the Narok County Council and by 1974, the section of the reserve was a declared a National Reserve and the remainder (159km2) were given back to communities. 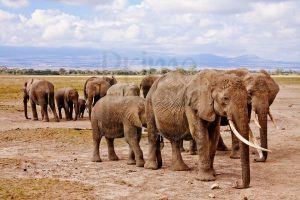 In 1976, other 162km2 were further given to the community and Maasai Mara decreased to 1,510 km2 in the year 1984. The TransMara county Council was created in the year 1994 to the west of the Reserve leading to the division of control among the new council and the already existing Narok county council. 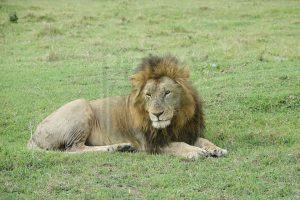 The Mara Conservancy a non profit organisation took over the Mara Triangle management in the year 2001. The Maasai Mara National Reserve marks the north extreme part of the Mara-Serengeti Eco system covering 25,000km2 in Kenya and Tanzania. 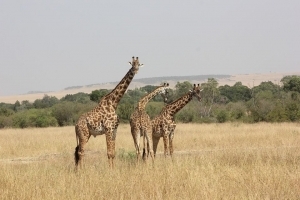 The Reserve is bordered by Serengeti National Park to the south, the Siria escarpment in the west, the Maasai pastoral ranches in the north, east and west. 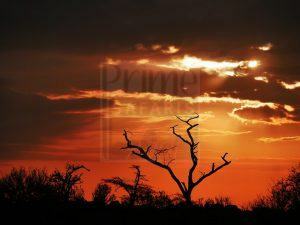 The reserve is drained by the Mara River and Telek River and rains are common along the south east and North West inclination. 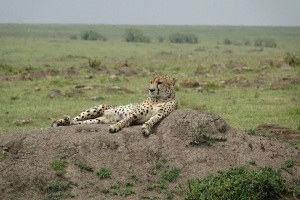 The Maasai Mara National Reserve terrain is majorly open grassland and it in between 1500 – 2180m of elevation receiving a Rainfall range of 83mm/month and a temperature range of 12-30℃. 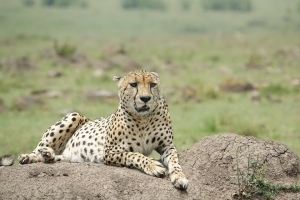 There are a range of wildlife species thriving in Maasai Mara National Park including the Wildebeest, Zebra, Topi, and Thomson Gazelle which tend to migrate every year in July to October to the Mara Reserve from the Serengeti forming the great Migration which is among the natural wonders of the world. 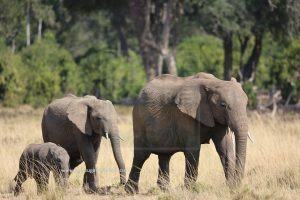 the Park is home to a myriad of elephants, leopards, Blackl Rhinos, Cape Buffalo, the Cheetah, the Hippos and Crocodiles in Terek and Mara Rivers, Jackals, Hyenas, Bat eared foxes, lion, Impalas, Grant’s Gazelle, Maasai Giraffe, Coke’s hartebeests, Roan antelopes among other species which combine to make the Maasai Mara National Reserve a perfect wildlife destination. Maasai Mara National Reserve features over 470 bird species most of which are migrants with 60 species being raptors. Among the bird species in Maasai Mara National Reserve include; Vultures, Secretary birds, Marabou Storks, crowned cranes, horn bills, long crested eagles, Ostriches, African Pygmy falcons, along with the National bird of Kenya – the lilac-breasted roller. At approximately 40,000 Km2 Serengeti Ecosystem, one is able to find one of the World’s Natural wonders. 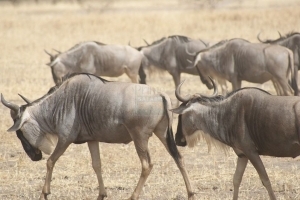 The Ecosystem is home to the Migration routes of white bearded wildebeest scientifically referred to as Connochaetes tuarinus mearnsi. 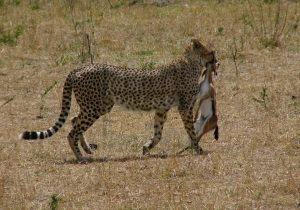 Maasai Mara National Reserve is gifted to be part of this great of Ecosystem. With over 1.7 million Wildebeest backed up by 400,000 Thomson Gazelle, 300,000 Zebra and over 120,000 eland, the Great Migration is by all means beyond the ordinary. These species cross the Mara River amidst the old gnashing Crocodiles and the accompanying land predators including Leopards, Hyenas, Lions, Cheetah and other lesser predators. Though no specific months of the year that guarantee the Migration, these seasons have an effect on their migration. From December to February and March is a short dry season while June to September is long dry season. From March to May, rains are heavy along with the months of October and November though there is no guarantee over this. 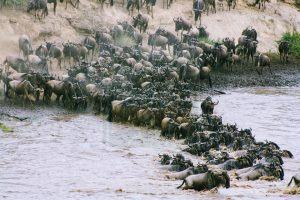 This happens in January and February with the Wildebeest cows dropping over 300,000 to 400,000 calves in a period of two (2) to three (3) weeks of one another. In the short grass plains in the lower slopes of the northern section of Ngorongoro crater highland through to the Olduvai Gorge. In this period, the predators have plenty to consume. The event is magical as the new born wildebeest gains steadiness more quickly than any other Ungulate and can stand in 2 – 3 minutes of their birth. It is able to run with the herd in five minutes after its birth and after that, can outrun a lioness. Around March, the short grass to the south of Serengeti begins to dry and the Wildebeest extend to the western woodlands. From the Olduvai plains, the Wildebeest move towards the small lakes of Masek, Ndutu and Lagarja in search of water. They scatter in the plains grazing on the short grass before disappearing altogether. The initial downpours of the extensive rains begin to occur. The herds of Wildebeest move to the North West as rains set in moving past the granite outcrops of Moru and Kopjes entering the Serenora Woodland to the west of Lake Victoria. 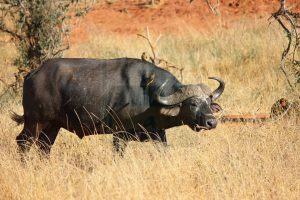 Here, the annual rut occurs with over half a million Wildebeest cows mated in a period of less than a month. The full moon of May and June offers an ideal encounter of this event. The territorial or dominant males fight during the rut though with less injuries. Interestingly, the cows do choose for themselves the right mate and not just the dominant male. 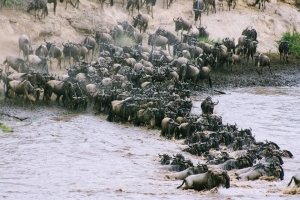 From the west of Serengeti, the Wildebeest herds move to the north entering Kenya’s Maasai Mara National Reserve following the rain or its effects. The herd cross Mbalangei River and River Grumeti in Serengeti and then River Mara in Kenya. The water poses an obstacle to the Migration as they harbour predators like Crocodiles and the land predators like Lions, Cheetah, leopard and Hyenas in the vegetation along the water bodies. 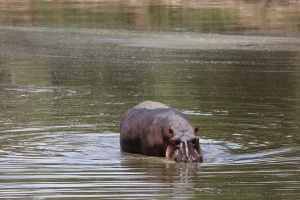 The wildebeest also drown in the water. The crossing points are not fixed and would thus depend on their choice in that very season. To the end of October, the short rains stimulate the growth of short grass in Serengeti plains as well filling the seasonal waterholes. The Wildebeest herds embark on the move via the Serengeti eastern landscapes with 90% of them carrying on the new season’s young. In the tight groups, the Wildebeest spread again in the open plains to feed. 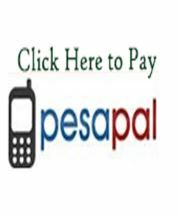 The Maasai – ancient settlers of the land on which Maasai Mara National Park is located possess remarkable culture and heritage that is worth exploring. This Nilotic group live a semi-nomadic warrior life well known for their ancient cattle rustling practice. They are re-known fearless worriers who thrived along with the wild life in the area. 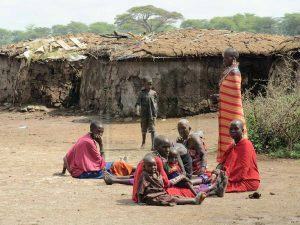 The Maasai are patriarchal with the elder men taking decision on behalf of the society. They believe in Engai who has a dual nature with Engai Narok (Black God) noted to be benevolent and the Engai Nanyokie (Red God) being vengeful. 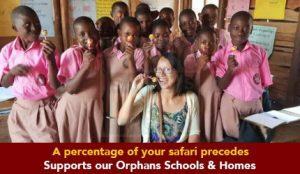 The Maasai are also well known for their precious jewellery. They recognize the baby after 3 months of age as a result of high mortality rate and the dead are left to the scavengers and those not consumed by scavengers are considered a disgrace. The generally depend on their cattle for food and social roles but due to economic changes, they have started to adopt cultivation. The Maasai culture is very interesting and their traditional ways of life are worth exploring. 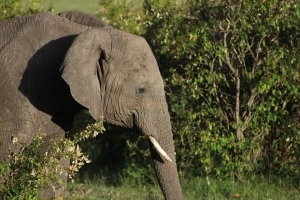 The game drive takes you through the impressive spots of Maasai Mara exploring the extensive wild game that thrives in the park. 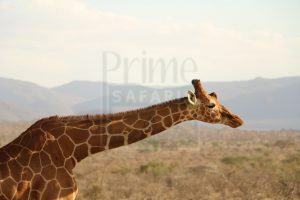 The game drive / game viewing in Masaai Mara can be conducted in the morning and in the afternoon. 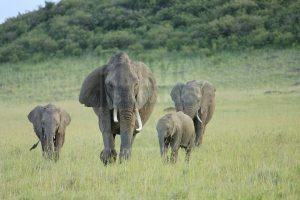 The Mara Reserve does not allow Night game drives. 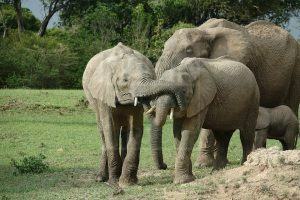 The activity offers possibilities of viewing the Big five namely Elephants Buffaloes, Rhinos, Lions and Leopards. A range of other wild game including Cheetah, the Zebras, Jackals, Hyenas, Bat eared foxes, Impalas, Grant’s Gazelle, Maasai Giraffe, Coke’s hartebeests, Roan antelopes among others might be explored. If the visit coincides with the Migration season, you have an opportunity to explore one of the natural wonders of the world. 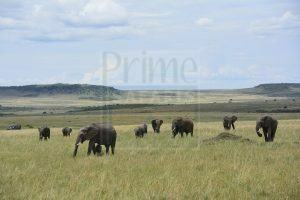 This offers a bird’s eye view of the Maasai Mara National Reserve. The activity involves spending one hour in the air floating silently over the savannah dotted with numerous wild game, scattered vegetation and the rivers at a distance. The activity is crowned with a bush breakfast. The visit to the Maasai Boma offers a complete taste of Kenya’s tradition especially if you are visiting this ancient land of the Maasai. The visit to the Maasai Boma offers impressive and authentic touch of the ancient Maasai tradition including their remarkable art and craft, the music, dance and drama along with their precious ornaments. This is a gold rated camp positioned in the wilderness area of Mara North Conservancy. The lodge feature more than 20 years of existence in a pristine setting. Accommodation at Elephant Pepper Camp is presented in eight (8) canvas tents with the views of the savannah. Spacious enough to accommodate an extra bed for a child below 16 years. The Matira Camp is a luxury facility in Maasai Mara National Reserve and features two units; the Matira Main Camp and Matira Adventure Camp. Matira Adventure Camp presents accommodation in six (6) bush camps featuring twin or double beds and the rooms are en suite with a flushing toilet and bucket shower. Keekorok is positioned in the Maasai Mara National Reserve at an elevation of 1,617m above sea level. Keekorok literally translated as abundance was built in 1962 spreading over 80 acres. 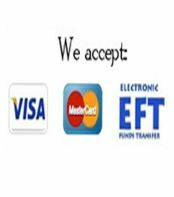 Accommodation is presented in 89 double rooms along with 8 superior rooms and four (4) suites.